Fyke the Mummy illustration development. 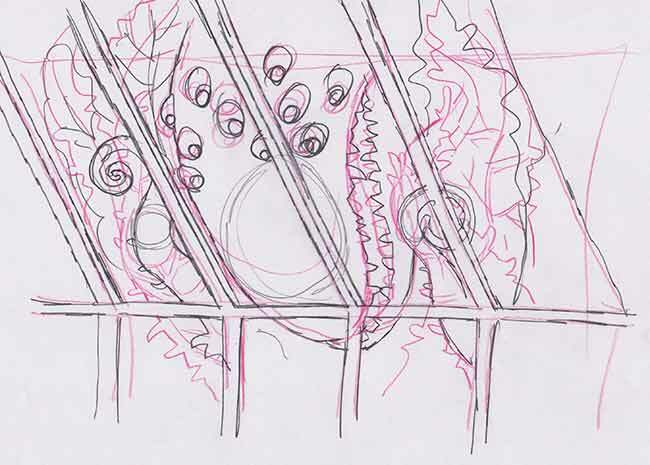 I think the idea of a monster mother plant peering in through the greenhouse windows arrived because I’d just finished watching BBC Scotland’s The Beechgrove Garden before I begun doodling. From the mad doodles I create I try to make a more considered version starting with a light coloured pencil and move to progressively darker colours giving me several attempts on the same page to sort out and refine composition and detail. I ran out of paper developing this one. The solution is stupidly simple. Stick on more paper. You can just see the masking tape holding on the extra sheet. The foreground is developing OK but the background monster is not so good. Combine this old well established pencil technique with a modern light table and you can build your development incrementally on top of all the work that’s gone before. Here I’ve split off the background monster to be developed separately. Here I’ve split off the monster in the background from the foreground so as to develop both separately. I used the light table to copy the monster to a new page (using the greenhouse spars as a register) and then I can develop her independent of the foreground. Only occasionally overlaying them on the light table to see if the thing is still working as a whole. The final drawing combining all the drafts with desperate attempts at keeping it smudge free. Once I have the drawings to my satisfaction I overlay them on the light table and make a clean hard single dark graphite final drawing on top, trying very hard not to smudge it as I work, which I will then scan into into Photoshop. Your eyes and brain have a built in ‘photoshop’ that filters out any smudges you make. But it doesn’t work when the drawing is scanned and on the screen. Only then do you see all your smudges big and dirty mocking your imagined nice crisp image. You have to be vigilant. I use Photoshop to digitally colour the image. I keep my colouring separate from the black and white line work . I use multiply for the line work layer which makes all the white transparent. Then I paint on the other layers underneath as it suits. mother plant coloured using layers in Photoshop both below and above the black and white illustration. Below is the final image. The safety glass label I made up in a separate Photoshop file and then copy and pasted it across into the illustration. You can read the captions that go with the illustration on the stooryduster site here that go with the Scottish word ‘Fyke’.